Sensitivity to wheat, gluten and FODMAPs in IBS: facts or fiction? IBS is one of the most common types of functional bowel disorder. Increasing attention has been paid to the causative role of food in IBS. Food ingestion precipitates or exacerbates symptoms, such as abdominal pain and bloating in patients with IBS through different hypothesised mechanisms including immune and mast cell activation, mechanoreceptor stimulation and chemosensory activation. Wheat is regarded as one of the most relevant IBS triggers, although which component(s) of this cereal is/are involved remain(s) unknown. Gluten, other wheat proteins, for example, amylase-trypsin inhibitors, and fructans (the latter belonging to fermentable oligo-di-mono-saccharides and polyols (FODMAPs)), have been identified as possible factors for symptom generation/exacerbation. This uncertainty on the true culprit(s) opened a scenario of semantic definitions favoured by the discordant results of double-blind placebo-controlled trials, which have generated various terms ranging from non-coeliac gluten sensitivity to the broader one of non-coeliac wheat or wheat protein sensitivity or, even, FODMAP sensitivity. The role of FODMAPs in eliciting the clinical picture of IBS goes further since these short-chain carbohydrates are found in many other dietary components, including vegetables and fruits. In this review, we assessed current literature in order to unravel whether gluten/wheat/FODMAP sensitivity represent ‘facts’ and not ‘fiction’ in IBS symptoms. This knowledge is expected to promote standardisation in dietary strategies (gluten/wheat-free and low FODMAP) as effective measures for the management of IBS symptoms. Dietary factors are known to precipitate/exacerbate IBS symptoms, for example, abdominal pain, bloating and bowel habit changes. Double-blind placebo-controlled with cross-over trials represent the current gold standard for confirming the dietary factor(s) involved in functional symptom generation. Based on the different dietary factors responsible for symptom generation, patients can be labelled non-coeliac gluten sensitive or more broadly non-coeliac wheat or wheat protein sensitivity or, even, FODMAP sensitive. 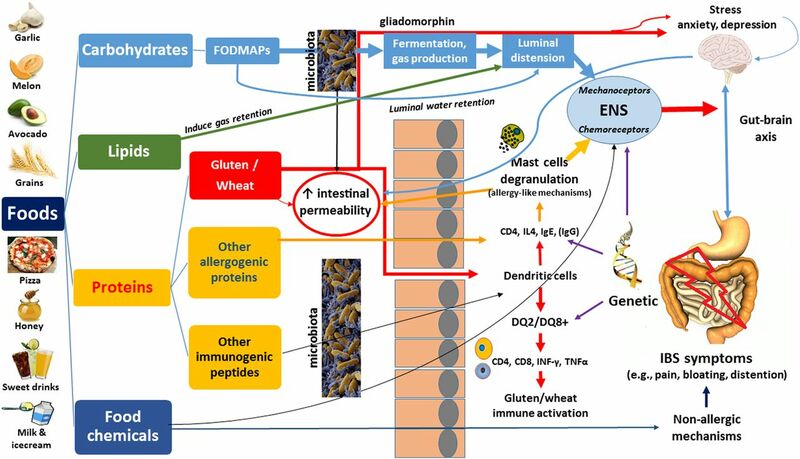 A better understanding of gluten/wheat/FODMAP sensitivity can be translated into new effective dietary strategies for the management of patients with IBS. IBS can be considered the prototype of all functional bowel disorders for its high prevalence worldwide and impact on patients’ quality of life.1 ,2 Patients with IBS suffer from abdominal pain or discomfort associated with bowel habit changes. In the absence of established biomarkers, for which research is actively ongoing, the diagnosis relies upon symptom evaluation according to the well-known Rome III criteria, which are currently the benchmark for IBS identification.1 ,2 Current estimates indicate that IBS prevalence ranges from 10% to 25% in the general population with a typical predominance of young adult women (3:1 F:M ratio).3–6 Usually regarded as a harmless disorder, IBS is known to severely hamper the patient's quality of life at least as much as organic disorders and is responsible for repeated absence from work as well as suboptimal performance on the workplace with relevant social costs. The mechanisms leading to symptom generation in IBS remain highly debated, although growing knowledge indicates that multiple factors are involved. Altered brain–gut axis with gut dysmotility and hypersensitivity, immune activation, leaky gut barrier function, changes in gut microbiome, genetic factors, infections, as well as psychological/psychiatric factors, can all contribute to symptom generation.5 ,7 ,8 The interest of the scientific community for these mechanisms has somehow obscured one of the most logical pathogenic factors—the role of food in triggering and perpetuating IBS symptoms. Recently, however, a number of studies linking type of food consumption to functional symptoms refuelled the interest in dietary factors in IBS, thus opening new avenues to treatment strategies.9 This review aims first to briefly address some key mechanisms involved in food-related symptom genesis; and second, to address the ongoing controversy about wheat, gluten and fermentable oligo-di-mono-saccharides and polyols (FODMAPs) in IBS, a controversy that is generating much debate and a growing body of research that is slowly sorting fact from fiction. Low-grade inflammation (mainly characterised by a dense mast cell infiltrate) is present in colonic mucosal biopsies of about two-thirds of patients with IBS.12 Mast cells are known to release a variety of mediators, including serine proteases, which evoke neuronal hyperexcitability, a major factor for functional symptom generation (eg, pain).13 ,14 Food components, particularly proteins, may be pathogenically involved with this process, either primarily or secondarily. One possible interpretation of such mucosal changes is that food components/antigens pass through a leaky (ie, more permeable) epithelial barrier, leading to mast cell infiltration and activation, thereby leading to IBS symptoms.5 ,8 Mast cells can be activated by allergy-like mechanisms, such as those involving food-specific immunoglobulin E (IgE). However, tests for food allergy detection that use the systemic immune compartment, such as skin-prick tests, have a poor sensitivity and specificity.15 Thus, immune response to food in IBS may require more sophisticated approaches to be demonstrated. One method is to present the offending protein to the gut immune compartment. A sort of ‘mucosal prick test’ renamed as colonoscopic allergen provocation (COLAP) test involves colonoscopy-guided submucosal injection to unravel food hypersensitivity.16 Seventy-seven per cent of a population with gut symptoms thought possibly related to food hypersensitivity had a positive COLAP test, which was consistently negative in the few control subjects. A more refined technique (confocal laser endomicroscopy) demonstrated that submucosal injection of food antigens caused increased infiltration with intraepithelial lymphocytes (IEL), formation of epithelial leaks/gaps and widening of intervillous spaces in more than half of IBS, and not in a small group of controls.17 These changes occurred within a few minutes of food antigen injection and predicted the clinical response to specific food withdrawal. Alternatively, circulating basophils have been used to determine allergens in vitro without the need to risk an allergic reaction when the patient is challenged. Indeed, basophil activation when exposed in vitro to dietary proteins, especially of wheat and milk origin, correlated with clinical responsiveness to dietary restriction of the relevant protein by one group,18 but another could find no specificity for basophil activation.19 Overall, these studies do suggest that reaction to food, whether it be via allergic, other immune or epithelial-damaging mechanisms, may play a role in the genesis of symptoms in some patients presenting with IBS. Confirmatory studies are needed before reaching diagnostic relevance. A wide array of foods contains potentially bioactive chemicals, such as salicylates, amines, benzoates and glutamate, which can elicit neurally and/or mast cell-mediated mechanisms contributing to IBS symptoms.11 ,23 ,24 However, a specific cause–effect mechanism between bioactive chemicals and symptoms is still far from being established. Empirical clinical experience indicates an improvement of IBS symptoms as a result of reduction of the dietary intake of bioactive chemicals. Nonetheless, clinicians should have a cautionary approach before advising dietary restrictions as nutritional defects may became a serious issue for the patient. Wheat is considered one of the foods known to evoke IBS symptoms.25 However, which component(s) of wheat is/are actually responsible for these clinical effects still remain(s) an unsettled issue.26 The two parts of wheat that are thought to have a mechanistic effect comprise proteins (primarily, but not exclusively, gluten) and carbohydrates (primarily indigestible short-chain components, FODMAPs). Two distinct views characterise the clinical debate: one line identifies wheat proteins as a precipitating/perpetuating factor leading to symptoms, while the other believes that FODMAPs are the major trigger for IBS. Reasons for apparent heterogeneity of results require dissection. First, subject selection might be a factor. For example, contamination of the cohort with CD can unduly skew results. This is why the exclusion of CD by combined histological and serological assessment while consuming adequate gluten is so important. In this respect, a critical point is to decide whether patients carrying HLA-DQ2/DQ8 and showing increased IEL density should be excluded from DBPC. Since about 40% of patients with NCGS is HLA-DQ2/DQ8+ and shows an increased IEL density, their exclusion would represent a pre-selection bias. In addition, 30–90% with positive responses to wheat protein/gluten has elevated IEL density in several studies.54 In the study in which 30% of patients with IBS showed sensitivity to wheat, there was a high incidence of eosinophilic infiltration of the mucosa and epithelium, features not described in the other reports, suggesting a different cohort being investigated.37 Second, nocebo responses can be a problem in re-challenge arms as evident in most, but not all, cross-over studies reported above. In the Australian study, 3 of 37 patients had gluten-specific induction of symptoms, but none of those three had such specificity of responses when a further DBPC challenge was instituted.43 The Italian study had 3 of 61 patients who demonstrated unequivocal specificity of gluten-induction of symptoms.39 It would be interesting to see if this is reproducible on a further DBPC challenge. Third, the active product that was used for the challenge differed from carbohydrate-depleted wheat protein43 ,53 to purified gluten39 to whole wheat flour,37 ,52 in its dose from low39 ,43 to high,37 ,38 ,39 ,52 and in its form of presentation from capsule37 ,39 to food.38 ,43 ,52 Finally, other design features including method of assessing the end-points and sample size differed. Over many years, there have been multiple observations that ingestion of certain short-chain carbohydrates—lactose, fructose and sorbitol, and fructo-oligosaccharides and galacto-oligosaccharides—was able to induce IBS-like symptoms, and that their restriction in the diet was associated with apparent improvement in symptoms in some patients with IBS (as reviewed in detail22). These carbohydrates have several key features in common. They are small molecules, containing only 1–10 sugars, and hence are possible osmotically active substances in the lumen of the intestine. They are slowly absorbed in the small intestine if monosaccharides are not absorbed at all if they contain more than one sugar due to lack of suitable hydrolases. Hence, they are present in the small intestinal lumen for a prolonged time and do increase the intestinal luminal water content. Their malabsorption leads to their exposure to intestinal bacteria, which rapidly ferment them to release short-chain fatty acids and gases (hydrogen, carbon dioxide and, in some people, methane). Their effects on symptoms and gas production are also additive. A dietary approach was designed to reduce the intake of all FODMAP groups, by finding in each food group low-FODMAP alternatives. Other adjuncts to reducing FODMAP intake, such as the use of lactase in food or orally to reduce lactose content of relevant foods, and the use of co-ingestion of glucose with food containing an excess of free fructose, were also proposed in patients with IBS.22 Knowledge of the FODMAP content of foods was patchy and limited, and an ongoing programme of detailed food analyses has corrected aberrant assumptions and filled in many gaps.55–57 Such information has been made readily available by an application (the Monash University Low FODMAP Diet App) that is updated regularly. The diet has been implemented by education via a dietitian trained in the principles of the diet. The dietitian would tailor the dietary advice to the eating patterns of the individual, ensure nutritional adequacy and provide written information and where to find accurate digital information. After 4–6 weeks, no or minimal response in an adherent patient should then lead to the abandonment of FODMAP restriction. If there has been a good response, consideration is then given to reducing the level of restriction by graded reintroduction of previously restricted foods with a focus on specific FODMAP groups. The patient is encouraged in the long term to restrict only to the level that is needed for symptomatic comfort. Unanswered questions include the mechanism by which FODMAP intake increases gastro-oesophageal reflux64 or induces tiredness.62 The role of chemoreceptor stimulation via taste receptors or short-chain fatty acid receptors with subsequent hormonal changes warrants further exploration. Likewise, the relationship of the efficacy of the diet with specific alterations in the microbiome, immune activation, specific patterns of dysmotility and the role of changes of gut microbiota when FODMAP intake is reduced65 in ongoing efficacy have yet to be explored. The principle that all FODMAPs have similar physiological effects and therefore should be considered together is true only to a limited extent. While all are capable of exerting an osmotic effect, this will vary according to the molecular weight and the rapidity of absorption. Thus, fructose and polyols have a greater osmotic effect per molecule than fructans and galacto-oligosaccharides, but the number of molecules in the lumen will fall more distally with fructose and polyols associated with their slow absorption as opposed to no absorption for oligosaccharides. Nevertheless, imaging does show greater small intestinal distension with fructose and mannitol or sorbitol.59 ,60 Conversely, oligosaccharides will have greater fermentative effects as they are not absorbed as opposed to absorption of fructose and polyols across the small intestinal wall, which is likely to vary according to the dose and speed of intestinal transit, and, for fructose, the luminal glucose content (glucose facilitates fructose absorption22) and individual absorptive capacity via fructose-specific transporters. While all FODMAPs are readily fermented, the relative speeds of fermentation of individual FODMAP groups have not been specifically studied. Each FODMAP group may have different effects on the structure and function of microbiota, but this has not been systematically assessed. In clinical practice, patients report different sensitivities to FODMAP groups, but such observations have not been formally studied. The low FODMAP diet restricts all FODMAP groups in its induction phase, followed by a step-down in restriction after 4–6 weeks if efficacious, but each aspect of this plan has not been subject to specific study. First, the need to restrict across all FODMAP groups should theoretically be associated with the highest chance of response, but this has not been tested. In observational studies, poorly defined diets that restricted fructose±sorbitol claimed benefits in 40–81% of patients with IBS or functional bloating.76–78 Similarly, a diet that restricted fructose and fructans in 62 patients with IBS and fructose malabsorption reported benefit in 74%; step-up to other FODMAPs was only used if response was poor.79 Second, while controlled trials have shown that maximal response in symptom reduction occurs within 7 days when all food is provided and a high degree of adherence is achieved, there is no evidence-base behind a 4–6 week induction. This duration was proposed give the patient time to learn the diet and to ensure persistence of the symptomatic improvement. It also offers a practical timeframe for review. Adherence was high where all food was provided on the basis of dietary diaries and breath hydrogen testing.67 However, where the diet is taught in a clinical setting, the ease to which patients can apply the diet and the consequent adherence are important issues. In a prospective evaluation of 90 patients with IBS in New Zealand, in which the diet was taught by a dietitian via one or two consultations, 61% of participants stated that the diet was easy to follow and 44% were able to incorporate the diet easily into their life.72 Adherence rates were also high, possibly because non-adherence was associated with symptom induction. Broad dietary change is associated with several risks that might include the following. First, nutritional adequacy of the low FODMAP diet has been evaluated in one study, where dietary calcium intake was compromised in some patients, presumably those who restricted lactose. The low FODMAP diet can be associated with reduction of fibre intake unless action is taken to seek non-wheat sources of fibre, as is instructed by dietitians delivering the diet. The nutritional adequacy of the low FODMAP diet needs to be assessed in a larger population, particularly in those who are self-taught. Second, the psychosocial risks of imposing dietary change cannot be underplayed. These range from difficulties in socialisation and eating away from home through to the precipitation of eating disorders such as orthorexia nervosa.80 Third, the physiological effects of reducing FODMAP intake beyond those targeted to improve symptoms may have other implications. The major effect documented to date is alteration by varying FODMAP intake of gut microbiota, such as changing total bacteria abundance and altering the relative abundance of Bifidobacteria.69 Diets differing in their FODMAP content were also associated with changes in the relative abundance of strongly butyrate-producing Clostridal groups or the mucus-associated bacterium Akkermansia muciniphila, both of which are positively associated with health.65 Interestingly, the changes in these bacteria comprised increased relative abundance in association with greater FODMAP intake than with the low FODMAP diet arm per se in comparison to the habitual diet. The health implications of such changes are not known but raise concerns about strict restriction of FODMAPs in the long term. Patients appear to be increasingly recognising an association of induction of gut symptoms and/or fatigue with the ingestion of wheat products such as bread and pasta. An Australian survey of 1184 adults identified that 8% avoid wheat or are gluten-free to relieve such symptoms.25 Because of the coexistence of fructans and gluten in wheat,57 the dilemma from a clinical point of view is which of the two evidence-based dietary approaches—GFD or low FODMAP diet—does one advise after excluding coeliac disease. A low FODMAP diet may offer a higher chance of symptomatic response, but GFD involves attacking a specific pathogenic factor if the injurious nature of wheat protein is integral to the genesis of visceral hypersensitivity or other gut-related physiological changes. In the absence of a biomarker of NCWPS, the only available means of identifying specific sensitivity to wheat protein is a trial of exclusion diet (strict GFD) and then DBPC re-challenge using purified wheat protein or gluten with symptoms as the read-out, as discussed earlier. There is no consensus regarding the choice of approach. Comparisons between the two dietary approaches are shown in table 3. The GFD approach might be preferable if the clinic is geared towards exclusion diet followed by DBPC re-challenge. Those having a negative response could have a trial with low FODMAP diet. Alternatively, the re-challenge methodology might be better applied in those with biomarkers suggesting relevant pathogenic events occurring in the intestine. Increased duodenal IEL density (>25/100 enterocytes), raised faecal eosinophilic cationic protein and tryptase,81 basophil activation in vitro18 or circulating antibodies to whole gliadin might enable better targeting of wheat protein challenges.37 A third alternative is that the low FODMAP diet is applied initially and, in those with insufficient response, gluten is also removed from the diet. If an adequate response occurs, then non-wheat-based FODMAP intake can be cautiously increased in a step-wise fashion to determine whether that is necessary. Much of the controversy has been generated by the poor awareness of the potential components of wheat that can induce symptoms. Gluten has been assumed to be the culprit because of its unequivocal key role in the pathogenesis of coeliac disease. In this way, the use of ‘gluten’ should be restricted to situations where gluten is the documented inducer of symptoms, ‘wheat protein’ where that has been the challenged factor, and ‘wheat’ where wheat products, such as bread, are used as the challenging agent. Likewise, further consideration will be needed in the terminology of clinical syndromes so that the current confusion of NCGS, NCWS and NCWPS can be put to rest. The lack of biomarkers for food protein sensitivity per se or individual protein sources is a significant impediment to progress. There has been considerable advancement in the application of techniques, such as confocal endomicrosocopy,17 which holds promise as gold standards upon which practical biomarkers might be compared. For interventional studies, exclusion of CD is critical and non-gluten-dependent diagnostic tests such as detection of gluten-reactive T-cells ex vivo82 are needed. Likewise, the design of such studies may benefit from expert consensus about several of the details to reduce heterogeneity and to improve the interpretation of outcomes. Long-term outcomes are also needed to reassure the durability of efficacy with various dietary strategies. The authors wish to thank Dr Giacomo Caio, Department of Medical and Surgical Sciences, University of Bologna, for insightful comments to the manuscript and valuable technical skill.
. The epidemiology of irritable bowel syndrome. Clin Epidemiol 2014;6:71–80.
. Food-related gastrointestinal symptoms in the irritable bowel syndrome. Digestion 2001;63:108–15.
. Gluten-sensitive diarrhea without evidence of celiac disease. Gastroenterology 1980;79:801–6.
. Sugar malabsorption in functional abdominal bloating: a pilot study on the long-term effect of dietary treatment. Clin Nutr 2006;25:824–31.
. Carbohydrate malabsorption and the effect of dietary restriction on symptoms of irritable bowel syndrome and functional bowel complaints. Isr Med Assoc J 2000;2:583–7. writing and editing of this manuscript. Competing interests PRG has published an information/recipe book on the low FODMAP diet, and his University and Department receive royalties from the sale of the Monash University low FODMAP Diet App.